ALMIGHTY God, give us grace that we may cast away the works of darkness, and put upon us the armour of light, now in the time of this mortal life in which your Son Jesus Christ came to visit us in great humility; that in the last day, when he shall come again in his glorious majesty to judge both the quick and the dead, we may rise to the life immortal; through him who lives and reigns with you and the Holy Spirit, one God, now and for ever. Amen. 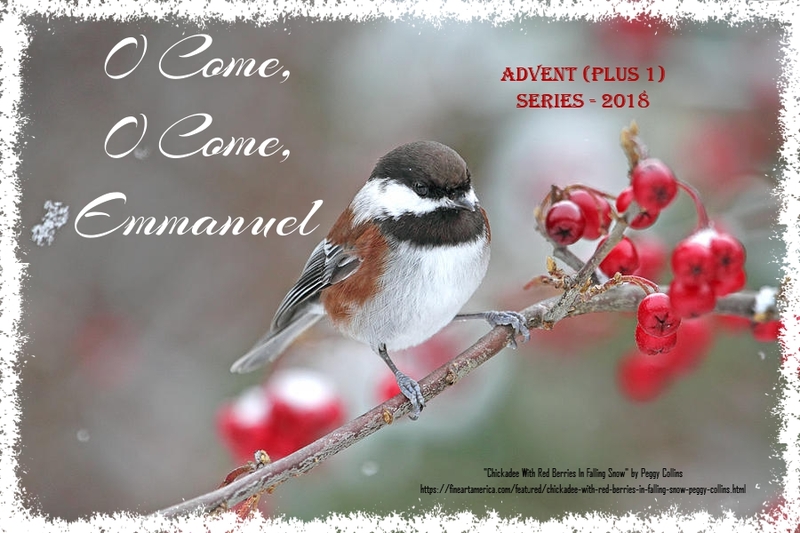 We heard last week how “O Come, O Come, Emmanuel” (TH 194) was an 8th century composition. This reminds us that every time we sing it we are adding our voices to millions who have sung these words for over a millennia and a half. We also learned that a different verse was sung each night from 16-23 December, and so, appropriately, we’re going to approach this Advent carol one verse per Sunday. Today we tangle with the second verse, mention the Scripture that it has grown from, and look at the Passage it hints of : “O come, O come, thou Lord of might, who to thy tribes, on Sinai's height, in ancient times didst give the law, in cloud and majesty and awe. Rejoice! Rejoice! Emmanuel shall come to thee, O Israel.” As we sing this carol reflectively and thoughtfully, we’re quickly struck by something peculiar: wherever you prick this carol, it bleeds Bible and glistens Gospel! But where in the world is the Gospel in our second verse?!?! “O come, O come, thou Lord of might, who to thy tribes, on Sinai's height, in ancient times didst give the law, in cloud and majesty and awe.” The answer is found in the following ways. First, we must think about this carol itself, and then reflect on a particular flow in Scripture. Notice that the other four stanzas in this carol are praying for what? Praying to whom? “O come, O come, Emmanuel” “O come, though Rod of Jesse, come” “O come, thou Dayspring from on high” and “O come thou key of David, come”. Emmanuel, rod of Jesse, dayspring from on high, key of David, are all older translations of Scripture that are descriptions of….Jesus! Which means, then, that this stanza is making a very astute statement: that this “Lord of might” who to thy tribes, on Sinai's height, in ancient times didst give the law, in cloud and majesty and awe is Jesus (before his becoming human)! That the eternal Son of God is the giver of the Law of God there in Exodus 19-20; and is the rescuing Redeemer: “You yourselves have seen what I did to the Egyptians, and how I bore you on eagles' wings and brought you to myself…And God spoke all these words, saying, “I am the LORD your God, who brought you out of the land of Egypt, out of the house of slavery. You shall have no other gods before me”” (Exodus 19.4-6, 20.1-3). Now we need to ask if Scripture agrees with what this carol is asserting. Our New Testament text in Jude gives us the answer. The English Standard Version makes it clearest “Now I want to remind you, although you once fully knew it, that Jesus, who saved a people out of the land of Egypt, afterward destroyed those who did not believe” (Jude 5). If you’re using other translations, it says “the Lord who saved…” but v.4 tells us who this Lord is: “our only master and Lord, Jesus Christ.” Jude makes it very clear (as does Paul in 1 Corinthians 10.1-4) that the eternal Son of God was there, involved in bringing about the redemption of God’s people from Egypt, was there in the wilderness wandering, was there at Sinai, was there bringing about the downfall of unbelieving Korah, Dathan and Abiram (Numbers 16) and others who did not believe. Therefore, it is right and relevant to make the connection with the one who is Emmanuel – God with us – and the giving of the law at Mount Sinai! “O come, O come, thou Lord of might, who to thy tribes, on Sinai's height, in ancient times didst give the law, in cloud and majesty and awe.” So, yes, wherever you prick this carol it bleeds Bible, and it does glisten Gospel; even this verse. But further, because v.2 is in the context of this carol, there is a hint of another Mountain – something of a new Sinai – that has tribes coming to receive the Law of God as the Israel of God. And so we move to Isaiah 2.1-5. Then observe that the yearning of those who are coming up is for the LORD to teach them (2.3b). These people have an anticipation that this teaching by the Lord of might will impact and infect their way of living and thinking. “That he may teach us his ways and that we may walk in his paths”!!!! There’s an anticipation of a new way, a new life, new patterns and new habits of life-style. “O come, O come, thou Lord of might, who to thy tribes, on Sinai's height, in ancient times didst give the law, in cloud and majesty and awe.” This template is laid down all over scripture: Come as you are, but thank God he won’t leave you as you are! Those who are desirously singing, “O come, O come, thou Lord of might, who to thy tribes, on Sinai's height, in ancient times didst give the law, in cloud and majesty and awe” know that they’re not what they ought to be, they’re not what they will one day be, but are also grateful they’re not what they used to be! Finally, with this new thing, this surprising attraction to God’s place and God’s way, there is a new definition (2.3c-4). This is an inside-out reorientation! Watch how the Hatfields and the McCoys, the Billy Yanks and Johnny Rebs, Sooners and Longhorns are transformed by the intervention of the Lord of might who has taught them. Though they come as they are, he doesn’t leave them as they are; and they’re mighty glad of it! The inside-out changes are liberating, making them capable and content to cast off all their ruptures and fractures. THEY (1) transform the means of war from plundering to plowing, from bloodshed to bounty; (2) toss the practice of war; and (3) trash the mentality of war.